Please click on the link to find out the number of days and hours you have left to get ready. But keep in mind that as with all Jewish holidays, the observance officially begins on SUNDOWN the DAY BEFORE. (In other words, FRIDAY, APRIL 19, 2019 will be the night of the next FIRST SEDER.) This link will automatically bring you to the time for US/Eastern Standard, so for all other time zones in or outside of US, please make sure to adjust accordingly! I just stumbled on your site in search of Sephardic recipes. Wow! I browsed quickly and picked a few out to try this Passover. I will definitely revisit after Passover when I have more time to read the stories and the people you write about. What a wonderful idea you’ve come up with and what an amazing site. Have a happy and healthy Passover, and thanks. Thank you Dorit! I’m glad that you found my site just in time for Passover and hope that you will follow me for the rest of the year as well. Chag Sameach! Hi Anna, Thank you for your comment. I am so happy that my cookbook is serving as a reference for your paper at the university! It was especially important to me that my book be used not only as a cookbook for recipes, but as a source for stories, traditions, and memories of the varying Jewish communities that are being lost over time. Retelling the Passover story at the Seder ceremony is a way to not only to remember our history, but to remind us of the slavery and oppression that continues to take place all over the world. For this reason the Passover festival remains relevant, and is practiced by so many Jews worldwide, from the secular to the most observant. I have even met more and more non-Jews who are curious about the customs, and are adopting this practice in various ways. All the best with your paper! 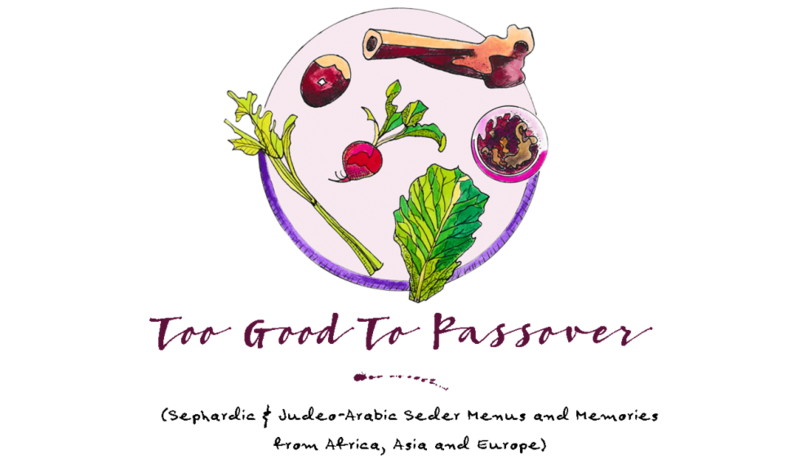 So happy to find your book, blog and everything else about Jewish cooking and Passover. I found you in the Penn Gazette, of all places! Apparently, we were classmates. Anyway, just ordered both of your books and excited to try them. Sephardim definitely have the better food…for all holidays! I’m glad that you found me, and am amazed how many people have contacted me after reading my blurb in the Penn Gazette! Thank you for ordering my books and helping me to keep the tradition of Jewish food and culture alive. I hope that you enjoy them both! Hi! Our family attends the Spanish & Portuguese Synagogue – Shearith Israel. Rabbi Meir Soloveichik is a truly amazing speaker, and his teachings on Shabbat are not to be missed. – prior to their departure from Egypt, the Jews were told to clear our homes of “seor”, not chamet. “Seor” means starter, or “levain” in French. – the Israelites, like many other early Middle Eastern people, were nomadic. They were shepherds who lived in tents. The grain products that they consumed were porridges and unleavened breads and cakes that one could carry easily and cook over an open fire. – the Egyptians,by contrast, had a settled civilization based on agriculture. They had homes, cities, and large ovens. Ancient Egyptians kept starter on hand, prepared and kneaded bread dough , let the dough rise, and baked it in their large ovens. Zoom to modern(ish) times. Every year, when Jews clear their homes of chametz, we also have to clear it of “seor” – of starter dough. After Pessach, we have to get new starter from a non-Jew, or start our own. In the Moroccan festival of Mimouna, Muslim neighbors of Jewish families would come over after sundown on the last day of Pessach. The Muslim friends would bring baked goods and starter for their Jewish friends. Culinary historian Gil Marks (of blessed memory) researched this custom among Moroccan Jewish emigres in Montreal and wrote about it. That’s all so interesting Francine. Thank you for sharing!